Dipolog Philippines spectacular landscape comes in full view 3,003 steps up the Linabo Peak. 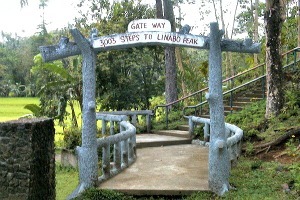 The 3,003 steps to Linabo Peak, originally named 1,001 Steps in the early 1990’s, is one of the favorite nature eco-tourism destination of Dipolog City situated at Sitio Dinginan in Barangay Lungdungan. Discovered by then City Mayor Roseller L. Barinaga and Mr. Hiroshi Ikeda, Director of Organization for Industrial, Spiritual & Cultural Advancement (OISCA) International, the original place was a massive stone-ground mountain slope with scattered boulders leading to Linabo Peak – Dipolog’s highest elevation point at 486 meters above sea level. It is about 6 kilometers away from the heart of Dipolog and is a 15-minute ride from the city proper. The once stone-ground mountain slope turned into a massive verdant forest after its discovery due to the extensive tree planting activities spearheaded by the City Government of Dipolog in partnership with OISCA International. The construction of the concrete steps and walkway started in 1994 winding up along a tunnel of verdant trees and fertile ground, leading climbers, trekkers, tourists and visitors to a panoramic view of the sky, plains and sea horizon. During Lenten Season, thousands of devotees, visitors and tourists participate in the annual “Katkat Sakripisyo”, a religious reenactment of Jesus’ passion, suffering and death through the traditional Way of the Cross, making their way through markers depicting the 14 stations of the cross, and ends at Linabo Elementary School. During summer, an annual invitational downhill bike competition is being conducted on the slopes of the 3,003 Steps to Linabo Peak, as one of the activities highlighting the city’s annual P’gsalabuk Festival every month of May. Reaching Linabo Peak, you have to experience a 50-meter rough trail trekking that leads to a breathtaking panoramic view of nature at its best. Linabo Peak houses on the north side, the towers of Smart Communications, Globe, and Telecommunications of the Department of Transportation and Communications (DOTC). The 3,003 Steps offers the adventurous and the daring, an opportunity to commune with mother nature and experiencing the feel of “being on top of the world” upon reaching the peak. The site also promotes physical fitness and well being but is not recommended for people with cardiovascular ailments.